Read on for all the details of this magical trip and comme toujours* if you have any questions at all, please do not hesitate to contact us. We’d love to help. Exotic and exciting, Morocco is an intoxicating blend of French, Arab and Berber cultures. Come with Lingua Franca from Monday 30 September to Monday 14 October 2019 as we embark upon un voyage incontournable*. Chaotic marketplaces, bedouin tents and salty sea breezes await. The storied Red City is where we’ll be spending the majority of our time with four nights at the start of the trip and four at the end. In Marrakech, it’s not about sight-seeing, per se. It’s more about taking the time to absorb it all: the colours, the smells, the tastes, the history and the world-famous hospitality of the people. Popular with wind-surfers, this coastal town will provide the respite we’ll need after our time in the desert. 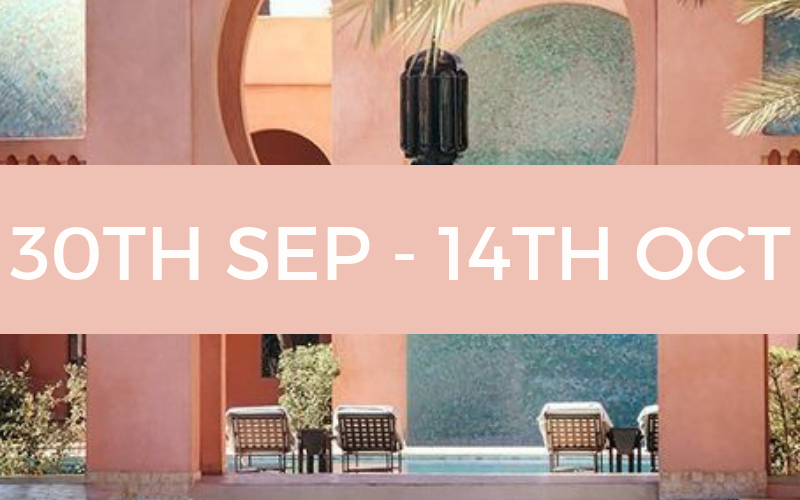 Arriving dusty, tired and elated, make the most of the roof-top sea breezes with a cool gin and tonic in hand or book yourself straight into a hammam* for an invigorating scrub with Morocco’s famous savon noir*. The best way to enjoy Morocco is to slow down, take your time, meet the locals and come to understand their way of life. There is something to be said for just wandering the streets and alleys of the medina* appreciating the architecture, activity and characters you’ll find. 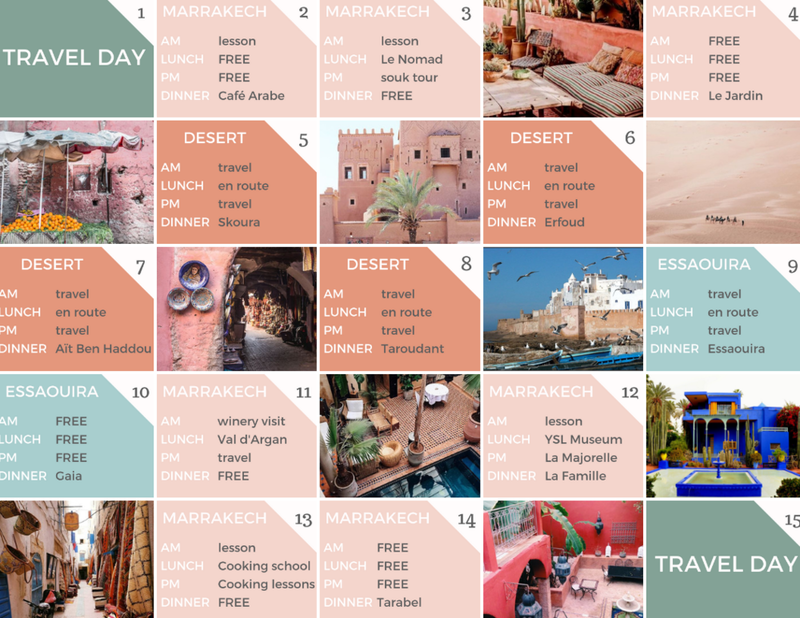 So we’ve gone light on the sight-seeing (though the Majorelle Gardens and new YSL museum are unmissable) in favour of experiences: a cooking class with a women’s collective, a visit to a winery just outside Essaouira for a vin gris* tasting and a guided souk* tour. (see sample itinerary below). Flights are not included in this package as we imagine many of you may wish to extend your stay at either end. As usual, though, we’re working with Emma Ross from Travel Managers and she’d be very happy to help you arrange your flights, as well as any further accommodation, activities and transfers you may require. Emma has told us there are some good specials around at the moment for Morocco so if you’d like to contact her, she’d love to help you. Emma also recommends booking your flights by March 2019 to take advantage of the best prices. Located in North Africa, Morocco is just 13kms from Europe, across the Strait of Gibraltar. French is widely spoken and serves as a lingua franca (common language) for its people. The Mediterranean and Atlantic seas and the Atlas Mountains and Sahara desert serve as spectacular natural borders. Who has not dreamed of riding a camel across the Sahara in a scene straight out of Lawrence of Arabia? Your destination? A bedouin tent in the middle of the desert for an unforgettable night of dramatic sunsets, traditional berber music and gazing at a sky thick with étoiles*. Lessons will take place in the morning and will be targeted to that day’s activity, giving you all the vocabulary you’ll need to really benefit from the experience. We’ve also arranged guest speakers to not only orientate you, but to shed some light on just what it is like to live in Morocco today. We have found an incredibly beautiful riad* in the loveliest part of Marrakech, with original decor that blends Moorish architecture with French Empire style. The charming French management will ensure you never want to leave this havre de paix*. 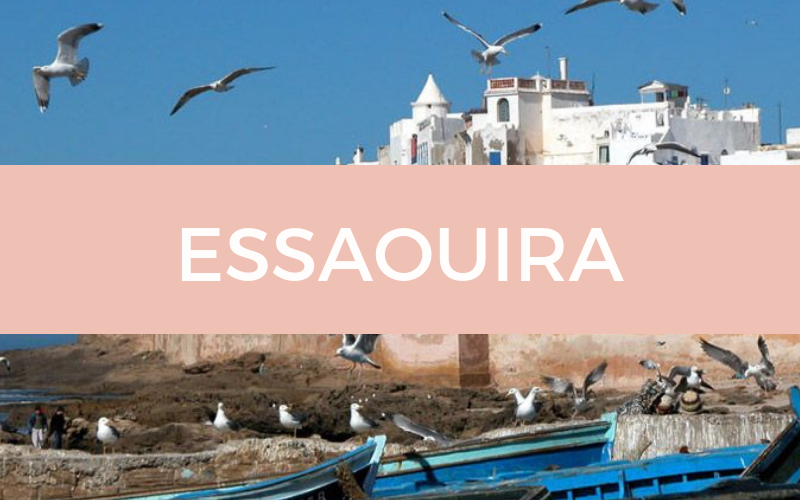 For the Essaouira accommodation, we have a short-list of unique properties and our final choice will be based upon the makeup of the group (see below). The accommodation for our desert road trip will include centuries-old kasbahs, charming guesthouses and of course, a traditional Berber tent for our night in the dunes of the Sahara. Friends and family are very welcome to come along and can participate in all organised activities, including the French lessons and talks if they have some prior knowledge of French. For those family and friends who do not wish to participate in the French lessons, we will have a driver available for that group on those days for them to set off on their own adventures. See below for full details of inclusions and exclusions. Here’s are des informations supplémentaires* for you to digest. If we haven’t covered something and you’d like to know, please contact us. The safety status of Morocco was updated to Level 1 earlier this year, which means it's now considered safe to travel to the country and tourists should exercise a normal level of caution while visiting. I’ve never felt unsafe in Morocco. It has a stable government, there is a police presence and for all the chaos of the cities, there is an order of sorts. It may be confronting at first simply because it’s so different from a first-world country, but the longer you’re there, the more at home you’ll feel. My memory from my first visit over ten years ago was of being lightly hassled by vendors and ‘helpful’ locals who wanted to show me the way directly into their uncle’s carpet shop. This time around, there was very little of that and I now know why, thanks to Time Out Marrakech. A riad is a large traditional house built around a central courtyard, many of which have been converted into boutique hotels and guesthouses. Thus, it is common to find that bedroom sizes vary somewhat, as they do in most houses. It is also rare to find a riad with more than five or six bedrooms. In fact, Riad de Tarabel, which will be our home for our time in Marrakech is actually two riads joined together (beautifully, I might add) and they’re looking at expanding into a third. For this reason, there is a discrepancy between the smallest rooms (doubles) and the largest which are suites. In the interest of fairness, we are going to ask the hotel to allocate the rooms in no particular order for our first four-day stay there, and then when we come back for our second, to reverse the order. Rest assured, though, all the rooms are lovely. If, however, anyone is interested in paying a supplement to nab a suite for both stays, please contact us to discuss. It is also for this reason that we have not yet confirmed the accommodation in Essaouira. Once we find out the mix of single and double rooms required, we’ll be able to make a decision. Count on it being centrally located, clean, interesting and of a high standard. Naturally, when we venture out for our four-night Atlas Mountains/Sahara adventure, the accommodation will be of a more basic nature. We’ll be staying in guesthouses and kasbahs (a type of fortress), which will be clean and tidy but simple. Only once will you be camping, and that is during our stay in a traditional Bedouin tent in the Sahara desert, and even that will be more akin to glamping. You’ll notice on the itinerary that we will be spending four nights ‘on the road’ on our desert adventure. It is true that you can reach the edge of the desert on a day trip from Marrakech, however everyone I spoke to warned against this. I was advised that to get the true experience, it was important to take longer. Even to reach the ‘real’ Sahara is a two-day trip, involving some very long stretches in a vehicle. It is for this reason we have spread our trip over four full days and nights, so we can take our time, not feel rushed and really get the maximum from what will be, for most of us I imagine, a once-in-a-lifetime experience. And never fear, there is no shortage of things to see on the way: mountains, valleys, passes, gorges, date markets, carpets, camels, tents, kasbahs and more. You’ll notice we’re asking for payment in three tranches*: a $2500 deposit to secure your spot, then a further payment of $3000 on 31st March 2019 with the balance due on the 2nd July 2019. This second payment corresponds with Riad de Tarabel’s terms and conditions for the hiring of the whole riad. All accommodation, two out of three meals, all activities, five two-hour French lessons, transfers. Flights, travel insurance (compulsory for travel with Lingua Franca Voyage - we will contact you shortly within 30 days of you paying your deposit) one out of three meals, any tips or personal expenditure. There is so much more to tell you but we don’t want to detract from the anticipation and mystery of such an exotic destination: we want to leave you to discover what it is that makes Morocco so special. However, if you do have une question importante*, do not hesitate to contact us. We’d love to help you and answer any questions you may have. Deposit are fully refundable until 31st December 2018. After that time they are 100% non-refundable. Places allocated on a first-come, first-served basis. Due to the size of the riad, places are strictly limited. A further payment of $3000.00 will be payable on 31st March 2019, with the final balance due 2nd July 2019.